Separate RGB allows you to move, rotate, scale, blur, blend, fade and distort the RGB channels independently. 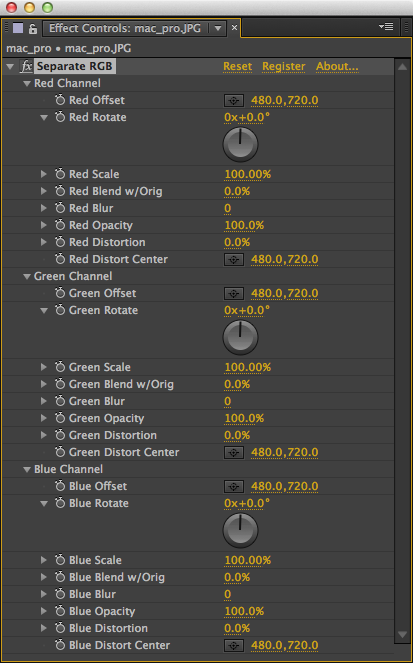 Note: The following parameters are common for every channel (Red, Green, Blue). Offset: Offset the current channel. Scale: Scale the current channel. Blur: Blur the current channel. Opacity: Change the opacity of the current channel. Distort: Create an optical distortion for the current channel. Distort Center: Center for the optical distortion.